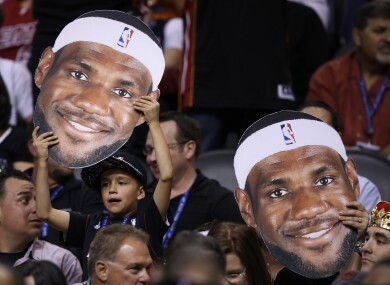 Miami Heat fans cheers on their favorite player, LeBron James. LEBRON JAMES SUNK the Golden State Warriors with a last-second three-pointer as the Los Angeles Clippers also won in the NBA last night. James completed one of his best displays of the season with a three-pointer in the dying stages lifting the Miami Heat to a 111-110 win over the Warriors at the Oracle Arena. The superstar finished with 36 points, 13 rebounds and nine assists in a complete performance much-needed by the two-time defending champions, who were missing Dwyane Wade (left foot). Stephen Curry’s three-point play – he finished with 29 points – had the Warriors ahead before James’ 27-foot shot silenced the home crowd. Miami comfortably lead the Southeast Division, while the Warriors are third in the Pacific Division. The Clippers pulled away from the Portland Trail Blazers to win 122-117 at the Staples Center. Once more, Blake Griffin was the star of the show as he scored 36 points and pulled down 10 rebounds in yet another stellar showing. The Houston Rockets made it seven straight wins after a 113-112 victory over the Washington Wizards. James Harden converted a driving lay-up with 0.7 seconds left to complete his 35-point haul and give the Rockets victory, while Dwight Howard (24 points, 16 rebounds) also starred. Tim Duncan (25 points) and Marco Belinelli (16 points, 11 rebounds) guided the San Antonio Spurs past the Boston Celtics 104-92. Monta Ellis’ 23 points led the Dallas Mavericks past the Indiana Pacers 81-73 at the Bankers Life Fieldhouse. The Toronto Raptors will hold the Atlantic Division lead heading into the All-Star break after a 104-83 belting of the Atlanta Hawks. A 20-point haul from Zach Randolph saw the Memphis Grizzlies edge their way past the Orlando Magic 86-81. Tristan Thompson’s double-double of 25 points and 15 rebounds helped the Cleveland Cavaliers overcome the Detroit Pistons 93-89 and the Brooklyn Nets were too good for the Charlotte Bobcats in a 105-89 victory. The Sacramento Kings claimed a 106-101 overtime win against the New York Knicks and the New Orleans Pelicans beat the Milwaukee Bucks 102-98. The Minnesota Timberwolves dominated the Denver Nuggets on their way to a 117-90 victory and the Utah Jazz were 105-100 winners against the Philadelphia 76ers. Email “Lebron James sinks three-point buzzer beater to seal win for the Heat ”. Feedback on “Lebron James sinks three-point buzzer beater to seal win for the Heat ”.